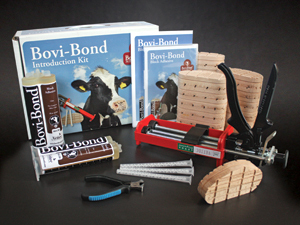 Bovi-Bond is a state of the art fast-setting adhesive used to glue rubber and wood blocks to bovine hooves. This strong adhesive sets quickly and secures a solid bond. It’s unique chemistry possesses no odors. Simply dispense to the block and position against the hoof. No mixing is required and no waste is produced. Bovi-Bond may be stored cold or warm and possesses a one year shelf life.